Just in time for the holiday - one of my favourite vegetarian appetizers! 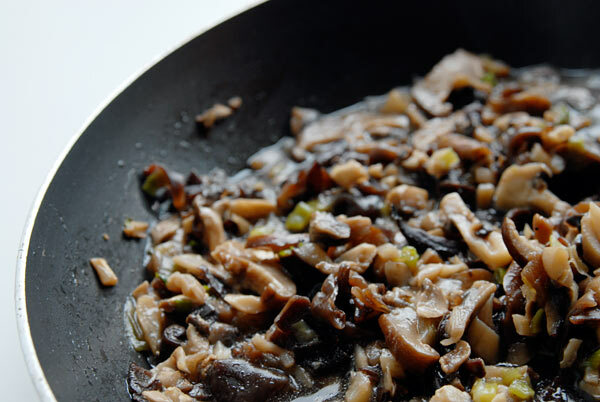 I love almonds, mushrooms and onions, so a spread made from all 3 is a no-brainer for me. This receipe is from an extremely old copy of Sunset Menus & Recipes for Vegetarian Cooking - copyright 1981 - no longer in print. I probably acquired this book in my 20's and am embarrassed to say I have only made only a few recipes from it. BUT......... those I have made were favourites for many years. Then we were blessed with 3 kids in only 3-1/2 years and my cooking became very simple out of necessity. We also found we didn't go out much at night - just too tired. Those recipes I used for parties fell by the wayside. With the kids now grown and my time not taken up running a magazine, there is quiet room now in my life to go back and wander down this memory lane of lost recipes. After finishing this pate to take to a birthday party potluck tonight, I find myself flipping the pages remembering the whole grain pancakes and waffles, the raised rolls with cottage cheese and bulgar wheat and so many more found within these pages. Then there are the recipes I tagged as wanting to try that just never made it to the table. I actually like my almonds just a bit darker. This recipe is pretty easy, but each step is important as written and you ABSOLUTELY have to use a food processor to get it as smooth as possible. What you serve it with is up to you. 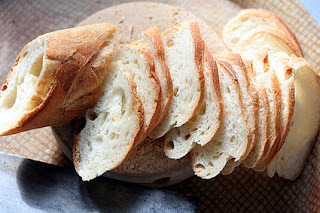 I personally love sliced baguette, especially whole wheat, but you can also use crackers, crostinis, etc. Preheat oven to 350 degrees. Spread almonds in a shallow pan (or on a piece of tin foil) and roast until lightly brown - about 8 minutes. Really keep an eye on the almonds as they go from barely roasted to burnt very quickly. Put the almonds in a food processor and process until the almonds have formed a paste (like very firm peanut butter). Scrap it down a few times during the process. It's important this is done completely to make the pate as smooth as possible. 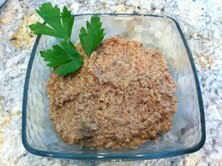 If you stop early, the pate will have a grainier texture. When it has formed a smooth paste, run the food processor while slowing adding the 2 TB of vegetable oil. Whirl until creamy and smooth, scraping down the sides if necessary. Melt the butter in a non-stick frying pan over medium heat. Add the onion, garlic, mushrooms, salt, thyme and pepper. Cook stirring occasionally until the onion is very soft and the pan juices have evaporated. Please remember that the butter will leave a small amount of oil in the pan that of course will not evaporate. What you are trying to remove are the juices that come out of the vegetables. The difference can be confusing to new cooks. Add the warm mushroom mixture to the almond mixture in the food processor. Whirl until the pate is smooth, scraping down the sides a few times. Place the mixture in a small serving bowl and cover tightly with plastic wrap. Chill until set. This can be spooned onto crackers, sliced baguette, etc. Haven't tried it with fresh veggies so not sure about the pairing. According to the cookbook, if cooled in a loaf pan (lined with plastic wrap, foil or parchment to make for easy removal), the pate can supposedly be gently sliced and presented on small plates along with crusty bread and other condiments as a first course. I have never tried this so beware. I have always found the pate quite soft so question if it will hold it's shape well enough to be sliced. Festivities begin today! The 25 days leading up to the holidays are always my favourite as they are full of get-togethers and family time that make this time of year special to me. So relax and enjoy!